Photo: Vie De La Campagne, 1st October, 1926. 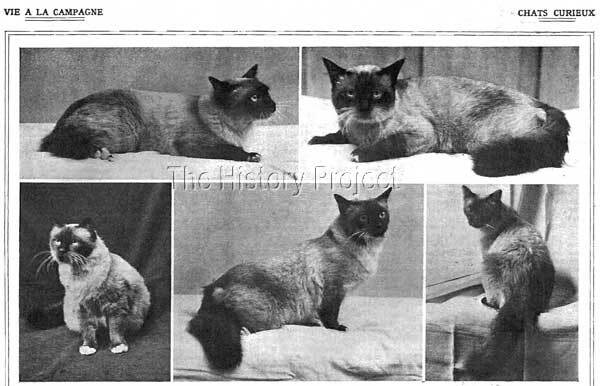 Courtesy of The CFA Foundation, Inc.
'Manou de Madalpour, can easily claim to be the first Birman male of significance to rise out of the emerging breed, since the tragic loss of his maternal grandsire, 'Madalpour' who was the 'Pater Originale,' and one of the only two Sacred Cats of Burma of record, to journey out of their native homeland and the mystical underground temple of 'Lao Tsun'. 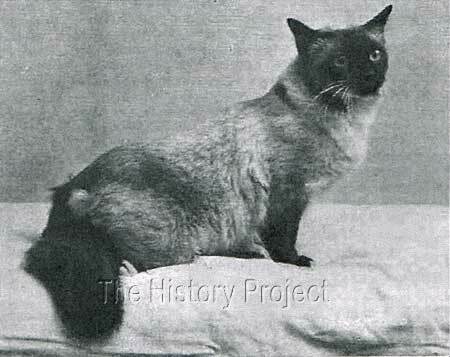 His connection to his dam 'Poupee de Madalpour' is unquestioned, as both were shown together in Paris, where 'Poupee' had made a sensational debut as a mature female at the International Cat Show in 1926, and in the following year, was accompanied by her son 'Manou' who at that time was shown under the ownership of Madame Marcelle Adam. As a breeding cat, he was an invaluable asset, as he now represented the best so far in a male, and one of the best options for securing the future of expanding the gene pool. 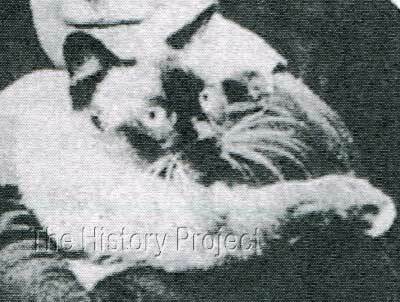 So we know that for the first breeding of 'Poupee' the outcross was likely to have been the Doctor's Siamese, which was of "unknown" ancestry, was probably shorthaired (possibly carrying long-hair) and that the first kittens were probably all short-haired. in the arms of his owner Madame Marcelle Adam. Although it is possible that 'Manou' could have come from this particular breeding, it seems unlikely given that he was a semi-longhair. It is more likely, that he was produced from another descendant of 'Poupee' bred back to her. (possibly as late as 1925). It is equally possible that the dam of 'Poupee' may have been bred again, to an outcross, and that there were eventually other options for 'Poupee' within two to three years. The term 'successive crosses' may be interpreted a number of ways. It could mean repeats of the same breedings, or a collection of breedings between resultant and alternative outcrosses! Regardless, the end result was 'Manou de Madalpour' and he was considered to be an absolute triumph against odds. By adding "..amongst others", we are left to expect that there may have been more, which are not listed or named specifically. Hence 'Manou' had a number of at least 'dam-siblings' and some may indeed have been full siblings. GB: "There was a passion for 'jumping on the band wagon' back then! Cat shows multiplied in 1927: at Bordeaux, Strasbourg, Charleville. The second great international show of the cat Club of France and Belgium was held in Paris, on the 14th and 15th January 1927. The reviews of the show, on the subject of the Birman, were brief and did not do them justice. 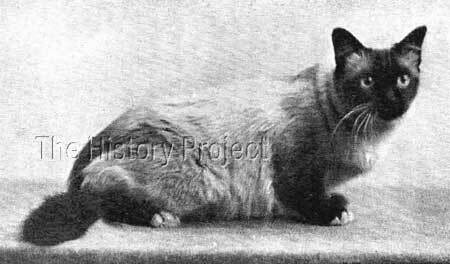 Two lines in "Vie a La Campagne": 'Three beautiful Birman cats, already shown in 1926, had fur that might be described as mid-length'." SP: "There was another international cat show in May 1927, organized by the Central Feline Society of France, founded the previous year. The General Secretary was M. Guingand." GB: "Indeed. Moreover, Dr. Mery had participated in the organization of this show. Manou de Madalpour made an appearance and one is able to read in 'Minerva', that he had won first prize. "In another magazine, one comes across Collette: She had shown two Chartreux cats, called at that time Auvergne cats or American cats! Three hundred cats of all colours, coats and varieties occupied their little cages, which were prettily decorated according to the whim of their owners. Here, a little Chinese temple, behind which, next to an incense stick and a little bronze Buddha sat the admirable Birman cat of Mme Marcelle Adam. There, in a corner covered in satin, Mme Collette jealously showed her two smoke-grey American cats, which she did not have the patience to keep imprisoned until the end of the event." SP: "I remember well that 'Manou de Madalpour' was the only Birman cat present at the Central Feline Society Show with permission of the Cat Club of Paris, part of the Cat club of France. The breed was not an easy one to create." GB: "A single Birman competed, effectively, at this show. There were comments in the papers of the time. 'It is unfortunate that this pretty breed has not expanded further. However it did not exist until a few years ago in France. The Birman coat and his qualities have to be the same as the Siamese: light colour coat, a distinctive mask of otter-brown and with beautiful blue eyes, but where the Siamese have short fur, that of the Birman is long and their four paws are gloved in white." 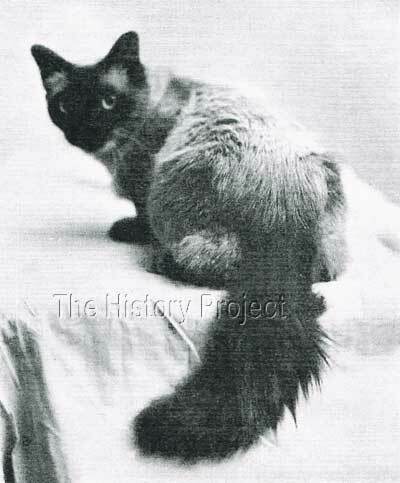 SP: "The breeders had settled upon the characteristics 'long-haired' fairly easily and also the Siamese markings but the gloves posed them a large number of problems." Although there are no official records proving progeny of Manou de Madalpour, it seems very likely that there could have been a good number. But unfortunately none have been found and there are no records available to show that Mme Marcelle Adams bred any, or of other breeders, such as Mme Leotardi, who owned his dam 'Poupee' having made use of him at stud. And even more notably, not even Marcel Baudoin-Chevoisier appears to have bred from him, which seems unusual given that he clearly bred from predominantly 'Madalpour' bloodlines and from various combinations of those, was able to produce the magnificent 'Dieu d'Arakan' in 1930. 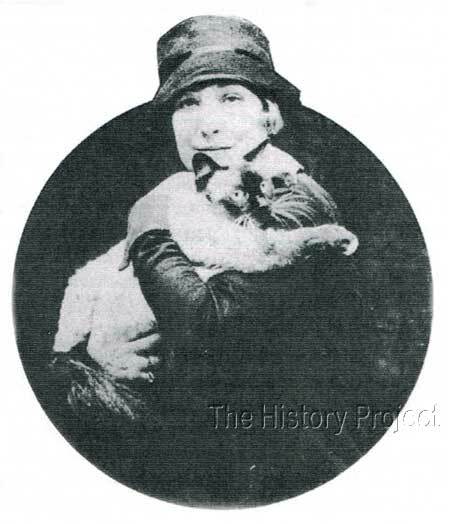 'Manou de Madalpour' in the arms of his owner Madame Marcelle Adam. 'Manou' appears in photos 1,4,& 5. 'Poupee' in photos 2 and 3. "Did you place a bronze Buddha and incense sticks in your cages, like Marcelle Adam did in 1927?" 'Manou' remains the earliest example we find of an actual Birman male, unique as direct long-haired descendant of his grandsire 'Madalpour'; bridging the gap between his pure Birman progenitor and the arrival of 'Dieu d'Arakan' only five years later. In being able to see and assess him visually, we can get a clear impression of the progress made between 1920 and 1930, and the amazing transformation that took place in what was the principal re-development of this exciting and emerging breed. The Birman Cat - The Sacred Cat of Burma, by Vivienne Smith. Photographs and Quotations as per credits listed.